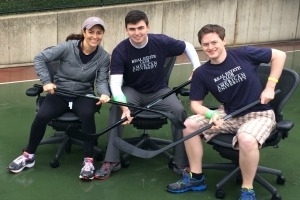 Master of Science in Real Estate students participate in the chair hockey real estate game. Pictured (left to right): Jennifer Rademacher, Mike Grein (2015 alumn), and Albert Palmer. The JDRF Real Estate Games, hosted annually at AU, aren't just about fun. They're about impact. "As a community, we have helped make people’s lives longer, easier, and more hopeful," says Sarah Dreyer, Director of Research at Vornado/Charles E. Smith and this year's event co-chair. "We've raised nearly $7 million over the game's 27- year existence. These resources help create real change." The Games also have a positive impact on the local real estate community by uniting individuals from across the industry. "Owners, developers, brokers, and builders alike participate, all in the name of helping others in need," Dreyer says. "There's no other real estate event that brings together so many different people to give back." Sponsored by Washington, DC, commercial real estate companies, the JDRF Real Estate Games were founded to fundraise for type 1 diabetes (T1D) research. The annual event brings together over 115 companies and 2,000 participants for a day of different sports competitions at AU. Proceeds benefit JDRF, formerly known as the Juvenile Diabetes Research Foundation, the largest charitable supporter of T1D research. "We are all collectively affected by type 1 diabetes," Dreyer says. "Through JDRF, our efforts go directly to the research being done to find a cure and improve the lives of those affected by T1D." The 2016 Games offered a slew of sporting event options, from basketball and wrestling tournaments, to 5K runs. Participants could register for more serious events, such as a weight-lifting challenge, or more light-hearted ones, like corn hole or tug-of-war. "It's a ton of fun," says Michael Grein, MSRE '15. "It's an event that brings everyone together for a great cause—within and outside your company." For Grein, a three-year veteran of the games, the event is also about forging and building relationships. "It gives AU students and alumni the opportunity to network with people in the industry, rather than having to reach out via phone or e-mail," Grein says. "You might find yourself competing in an event against someone you end up doing business with, or even working for." The Games provide a consistent point of connection for AU and D.C. real estate companies, as well. Because the event takes place every year, it helps students and working professionals stay in touch and involved in each other’s lives. “It’s a really unique way for the university to interact with the real estate community at large.,” Grein says. Grein’s favorite event by far is the Allsteel Chair Relay. A four-person relay where teams race each other while sitting in office chairs, the competition presents a fun opportunity for co-workers to bond and work together outside of the office. "It's definitely something a little different than your normal luncheon or happy hour," Grein jokes. Perhaps the greatest highlight from the 2016 Games, however, is the record-breaking amount of money that was raised. The planning committee not only met their $500,000 goal, but well-surpassed it, bringing in a whopping $520,000. This topped the previous fundraising record by nearly $40,000. “We are absolutely thrilled to have raised so much this year,” Dreyer says. Moving forward, Dreyer hopes the Games will continue to grow, both in terms of the level of money raised and number of participants. “Each year, though it seems impossible to get any better, we always top the last in terms of dollars raised and number of participants,” Dreyer says. “I hope the event continues to expand so it can have more and more impact on people living with type I diabetes.